This trading system Gann Signal System is based on 8 indicators,trend following. Currency pair: EURUSD, GBPUSD, USDCHF, USDCAD, AUDUSD, GBP/JPY, NZ/USD, AUD/JPY. Gann Signal Bars green bars. Gann Signal Bars red bars. Stop loss and take profit are indicated on the corner if the screen. 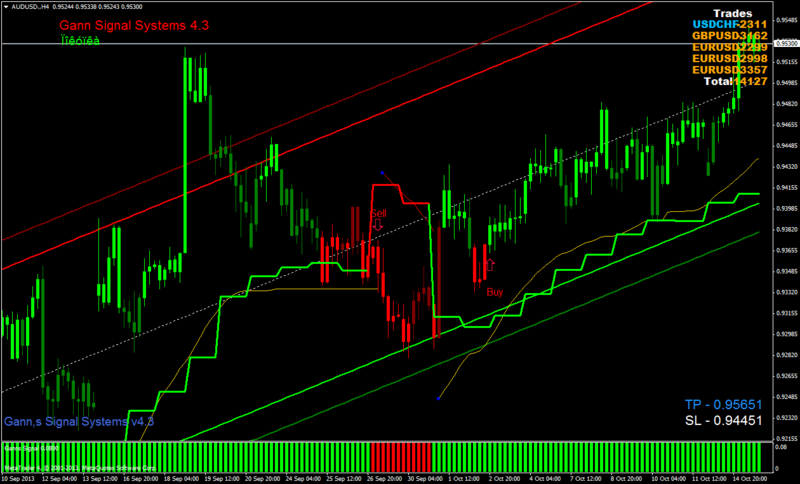 No more than 2 trades at once on the currency pair previous indicated. In the picture below Gann Signal systems in action. where is the signal dear...???? buy sell arrows not there .....??? i cant find the buy and sell arrows in the system. Love the system, it is giving good signals......one small favor to ask though. Can someone tell me what language the system signals are in or possibly change them to english?...Thanks.